If an unexpected disaster forces you to suddenly evacuate from your home, is your vehicle equipped to drive you to safety? It will be if you follow the advice in this book. Build the Perfect Bug Out Vehicle shows you how to outfit any vehicle with equipment and survival gear that will help you quickly drive from ground zero to a safer location. Survival expert Creek Stewart, author of the best-selling Build the Perfect Bug Out Bag, details from start to finish everything you need to equip an everyday vehicle for a drive through and away from disaster-stricken areas—from survival supplies and storage solutions to off-road travel, communication, navigation, and security considerations. You'll find: Practical and affordable Bug Out Vehicle equipment and principles that can be applied to any vehicle, even your everyday family car, Photos and explanations of every item you need for your vehicle, Resource lists to help you find and purchase gear, and you'll also find special considerations for bugging out using alternative modes of transportation including bicycles, boats, ATVS, motorcycles, horses, carts, aircraft and more. A disaster could strike your home at any moment. Don't be trapped in the devastating aftermath. 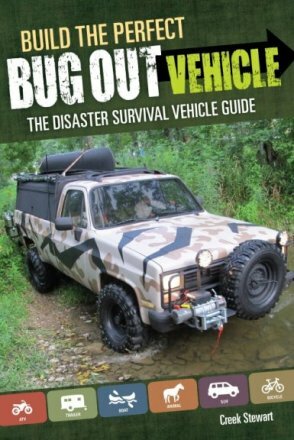 Quickly transport yourself and your family to safety by building a Bug Out Vehicle today!